Penfold design Edwardian postal box, located outside Olveston's main entrance in Cobden St. The cypher of King Edward VII (ER) can be seen on the front. 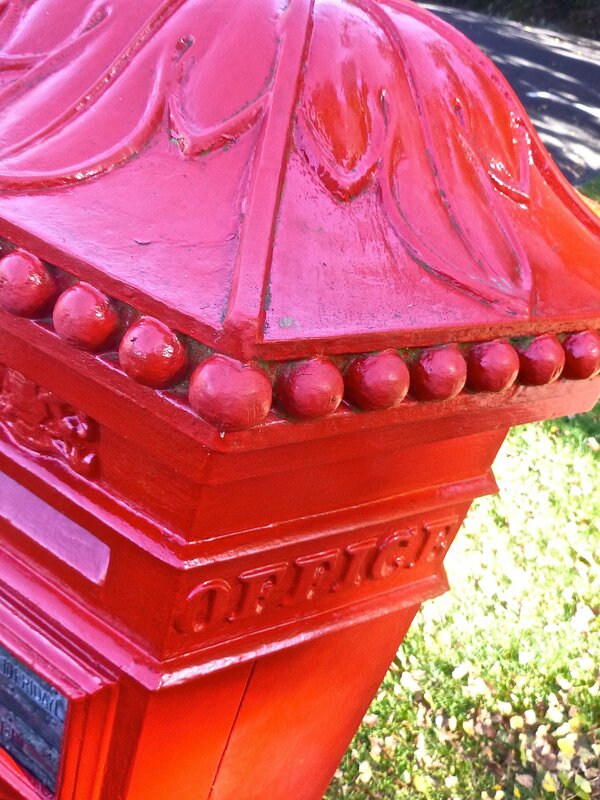 The red pillar postal box by the main gates of Olveston, the Theomins' family home, is one of the few of its type remaining in New Zealand and can be regarded as a British cultural icon. As our social customs change, with letter writing no longer the quintessential method of distance communication, it is worthwhile preserving such items of historical significance. Shona McFarlane CBE (1929-2001), a Dunedin artist, journalist, broadcaster and heritage advocate, was instrumental in saving this particular relic and it is still in public use today. It is a Penfold-style pillar box, named after John W. Penfold, an English surveyor and architect famous for his Post Office pillar box designs of the 1860s-70s. The idea for roadside letter boxes for Britain was suggested in 1840 by Sir Rowland Hill, Secretary of the Post Office, who had seen them in Europe. It was not until 1852 (on the recommendation of Hill's surveyor, novelist Anthony Trollope) that a letter-receiving pillar was trialled at St Hellier, in Jersey, a Channel Island. The cap's decorative detail is based on a stylised acanthus leaf, a motif dating back to classical times. Modern popularity of acanthus leaves depicted in architecture and applied arts can be traced to the English Arts and Crafts Movement of the late 1800s, most closely associated with William Morris, the famed English textile designer, artist and writer. In 1855 the first postal boxes for London were erected, but when people complained about their ugliness the committee for science and art of the House of Lords came up with a design - an ornate box festooned with Grecian-style decoration. In a major oversight, it lacked any posting aperture. Never let a committee have design responsibility! More designs were to follow and from 1866-79 the elegant hexagonal Penfold box became the ``New Standard Letter Box''. Early Victorian boxes were painted green, to be unobtrusive, but people kept walking into them; therefore from 1874 red became the standard colour. Widespread across England and Ireland, Penfold boxes were subsequently adopted in various British colonies. New Zealanders embraced the postal service with enthusiasm. Stick-on postage stamps were first used here in 1855, becoming compulsory for national post in 1862. With the introduction of the one-penny universal stamp in 1901, more and more people took advantage of affordable postage. In 1905 New Zealand was the first country in the world to prototype and install stamp vending machines. By 1912 New Zealanders posted an average of 139 items per person each year, the highest rate in the Universal Postal Union. Two people who featured on stamp designs had close connections with the Theomin family, of Olveston. In 1957 Sir Frederic Truby King, founder of the Plunket Society, was the first New Zealand-born person to appear on a stamp. In 1973 the first paintings by a New Zealand artist to appear on stamps were works by Frances Hodgkins. With New Zealand Post removing more and more postal boxes, it is to be hoped that the heritage one outside Olveston will remain as a reminder of what used to be. Prepared by Jenny Longstaff, Olveston Historic Home tour guide and educator.